Modern society obsessively avoids suffering, risk and danger. It secures everything with seatbelts and safety rails, air conditions the summer heat, prints warnings on coffee cups and advises that that safety glasses should be used while working with hammers. Certainly such precautions have prevented misfortune. However, since heroism and excellence are born from confronting rather than avoiding suffering and peril, the mania for safeguards has also diminished the notion of these qualities. This is unfortunate since only those intrepid souls who confront danger, endure suffering and overcome obstacles merit mention in the annals of history. A shining example is the leper king, Baldwin IV of Jerusalem. One day the tutor made a frightening discovery. While roughhousing with friends, Baldwin never cried out in pain, even when the other children dug their fingernails into his arm. Knowing how tough the nine-year-old prince was, William of Tyre first assumed that Baldwin was restraining himself, but closer observation revealed that his arms were entirely numb – a telltale symptom of leprosy. Four years later, King Amalric died suddenly. Despite his sickness, Baldwin was crowned king by the unanimous decision of the High Court of Jerusalem.2 Since he was only thirteen, his nearest relative, Miles of Plancy, became regent. Shortly thereafter, Miles was murdered and Raymond of Tripoli replaced him. Raymond of Tripoli managed escalating tensions between the Crusader kingdom and its Muslim enemies through a policy of appeasement. He established full peace with Saladin in 1175. The treaty greatly favored the Muslim leader. Jerusalem had agreed not to support the Sicilians who were attacking Saladin’s power base in Egypt and the latter had free reign to build up his forces through conquest in Syria, where his trajectory revealed plans to encircle the Crusader kingdom. Saladin continued his quest with impunity, until governmental change in Jerusalem put a stop to his marauding joyride. One of Baldwin’s first actions as king was to reject the peace made with Saladin and raid the lands surrounding Damascus. In 1176, Baldwin came of age and took charge of the kingdom at the tender age of 15. During the two years since his coronation, his condition had worsened, and was now clearly discernable as leprosy. One of Baldwin’s first actions as king was to reject the peace made with Saladin and raid the lands surrounding Damascus. This forced Saladin to quit his attack in Aleppo and adopt a defensive posture. Later that year, the young king led another raid in the Beka’a valley in Lebanon and Syria, and defeated an attack led by Saladin’s nephew. In the first months of his reign, Baldwin proved his capacity to rule. By countering Saladin with an attack on Damascus rather than a frontal assault at Aleppo, Baldwin demonstrated maturity and wisdom beyond his years. This wisdom would guide Baldwin throughout his short life. His insistence on invading Egypt in autumn of 1176 was another example of it. From the beginning of his reign, Baldwin planned to hit Saladin in his Egyptian power base. Lacking sufficient naval strength, he forged an alliance with the Byzantine Empire. The stage was set for invasion. However, the king’s brother-in-law, William of Montferrat, a key element to the raid, fell sick and died. Then Baldwin fell ill and the entire operation was jeopardized. Hoping that Philip would salvage the doomed mission, Baldwin offered him regency until he could recover. Philip did not like the terms of the deal and refused. Raymond of Tripoli opposed the attack and the new Grand Master of the Knights of Saint John, young and inexperienced, hesitated. When Byzantine ambassadors became skeptical of the mission and withdrew their support, the assault the king so desired was cancelled. Never again would the Crusaders have such an opportunity to wound Saladin in his power base. Only Baldwin had been wise enough to recognize the mission’s importance. 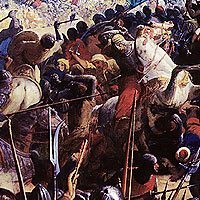 More than wisdom and courage, what made Baldwin IV a great king was his indomitable faith – a virtue he demonstrated at the famous battle of Montgisard. After the attack on Egypt was cancelled, Philip of Flanders took his army to campaign in the northern territories of the kingdom, where Raymond of Tripoli joined him. The move left Jerusalem in a precarious situation. Very few troops had stayed behind to defend the capital and the king’s condition had worsened. Saladin was quick to seize the opportunity and directed his main army of 26,000 elite troops toward Jerusalem. 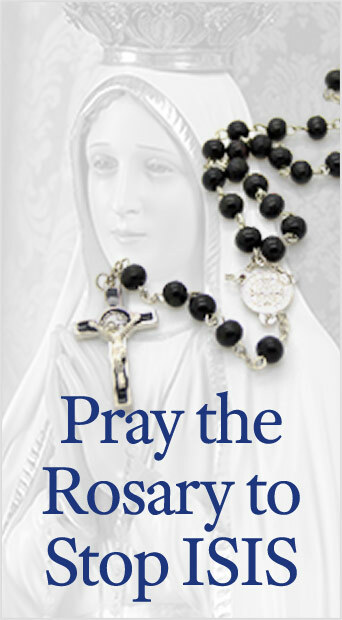 Seeing the overwhelming Muslim army, the Christians became petrified. However, such desperate situations afford great men an opportunity to show their mettle, and Baldwin rose to the challenge. Dismounting his horse, he called for the Bishop of Bethlehem, to raise up the relic of the True Cross he carried. The king then prostrated before the sacred relic, beseeching God for success. Rising from prayer, he exhorted his men to press the attack and charged. The one constant in Baldwin’s life was an unflinshing acceptance of the cross Providence put before him. The glory of triumph did not relieve the increasing effects of Baldwin’s leprosy. As time wore on he would lose the use of his limbs and eyes. However, never once did he use his sickness as an excuse to shirk his duty. When his request was ignored, the king began looking for a suitable husband for his sister Princess Sibyl. She was the oldest in the family and whoever she married would inherit the kingdom. Baldwin hoped she would wed someone from Europe, thus securing western protection for the kingdom after his death. He made arrangements for a marriage between Sybil and Hugh of Burgundy, but the plans fell through. To force Baldwin’s hand and control Jerusalem’s future, Raymond of Tripoli and Bohemond of Antioch then planned a côup. Their efforts failed because when they arrived at the capital, Sibyl was already married to Guy de Lusignan. Although Baldwin had hoped to abdicate to Guy after the marriage, his brother-in-law was a great disappointment. Limp-wristed and disliked by many of the crusader barons, Guy was not suitable to reign and Baldwin was forced to remain on the throne. Arguably, these internal struggles cost Baldwin more anguish than the leprosy that continued to devour his body. The years after the marriage continued to be turbulent. Baldwin secured a two-year truce with Saladin that ended prematurely, when Prince Reynald of Antioch sacked a Moorish caravan en route to Damascus and refused to return the prisoners or spoils even when the king ordered him to do so. Saladin also violated the treaty by seizing the crew and cargo of a Christian vessel that shipwrecked on his shores. Then anti-Western sentiment broke out in Byzantium with the ascension to the throne of Andronicus Comnenus. Realizing the Crusaders lacked Byzantine support, Saladin attacked the castle of Bethsan. Baldwin immediately marched against the Moslem aggressors and repulsed them, though he had a much smaller army and was probably too weak to fight by this point. In 1183, the king became blind and unable to use his hands and feet. He appointed Guy de Lusignan permanent regent. However, when the heir proved unable to unify the Crusader barons and refused to engage Saladin, while commanding the largest Christian force ever assembled in the Holy Land, Baldwin removed his regency and once again shouldered the kingdom’s responsibilities. Later in 1183, the king’s half-sister Isabel married Humphrey IV of Toron at the Castle of Kerak. Although Baldwin was too sick to attend the wedding, many other influential Christian leaders were present. The opportunity to capture them was too tempting for Saladin to resist. He surrounded the castle and besieged it in the midst of the celebration. Though utterly incapacitated, Baldwin took it upon himself to rescue the entrapped nobles. Blind and lame, he ordered that he be carried into battle on a stretcher. Realizing that the king had arrived to succor the fortress, Saladin signaled the retreat without engaging the Christians. The same scene was repeated when Saladin again tried to take the Castle of Kerak in 1184. Once again, Saladin retreated when Baldwin was brought into battle on a stretcher. Deprived of all strength and power, Baldwin had triumphed over his lifelong enemy one last time. Later in 1184, Baldwin contracted the illness that would eventually take his life.10 The problem of succession had been somewhat resolved in 1183, when Baldwin crowned his five-year-old nephew, Baldwin V, co-king in order to exclude Guy de Lusignan from the throne. While modern readers may find this harsh, Guy had openly defied the king twice, once going so far as betraying his feudal vow. Such defiance could not go unanswered. Starved for viable options, Baldwin appointed Raymond of Tripoli temporary regent. When it became clear that the king was in fact on his deathbed, Jerusalem needed a more permanent solution until King Baldwin V came of age. The leper king deferred this all-important decision to the High Court, who chose Raymond of Tripoli. 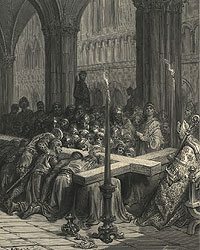 Having done his best to provide for his kingdom, Baldwin IV relinquished his soul to God on May 16, 1185 and was buried in the Church of the Holy Sepulcher. Suffering was the one constant in Baldwin’s life. From his earliest years until his last moments, he endured a leprosy that rotted his body and represented the rottenness of his kingdom, which, owing to internal discord and corruption, fell to Saladin two years after Baldwin’s death. Baldwin’s capacity to manage the precarious state of his kingdom resulted from his willingness to shoulder his cross in imitation of his Master. He never once used his sickness as an excuse to shirk his responsibilities, even when it reduced him to utter incapacitation. Modern society, which flees suffering like the plague, needs models such as Baldwin IV, the leper king who drank until its very last drop the chalice of bitterness that Providence put before him. It needs archetypes that shatter the Revolutionary myth that suffering is an absolute evil, to be avoided at all cost. The Church has a saying that reads: “Per Crucem ad Lucem” (Through the Cross to the Light). Baldwin IV not only understood these words, he lived them. Because he did, he will forever be esteemed by those who sacrifice their personal interests for the common good. He will be admired by those willing to confront danger and suffer for a higher cause. In a word, he will be enshrined in those souls who shun mediocrity and aspire to greatness. – This article relied heavily on Bernard Hamilton’s book, The Leper King and His Heirs for historic data and on three meetings given by Professor Plinio Corrêa de Oliveira for inspiration. Bernard Hamilton, The Leper King and His Heirs: Baldwin IV and the Crusader Kingdom of Jerusalem (New York, Cambridge University Press, 2005) p. 43. At this time, Baldwin’s sickness was certainly known, but the diagnosis of leprosy had probably not yet been made with certainty. During that time, if a knight or sergeant were diagnosed with leprosy, he was made to join the Order of Saint Lazarus, a religious community formed to care for leprous nobles. Cf. Bernard Hamilton, The Leper King and His Heirs, p. 29. Stephen Howarth, The Knights Templar (New York, Barnes and Noble Books, 1991) p. 132. Bernard Hamilton, The Leper King, p. 119. Cf. “Battle of Montgisard,” http://en.wikipedia.org/wiki/Battle_of_Montgisard. Bernard Hamilton, The Leper King and His Heirs, p. 133. Stephen Howarth, The Knights Templar, p. 133. Bernard Hamilton, The Leper King and His Heirs, p. 136. Despite the horrible effects of the type of leprosy Baldwin had, it rarely provokes death. The king’s final illness was probably the result of infection from one of his many wounds. Cf. Piers D. Mitchell, “An evaluation of the leprosy of King Baldwin IV of Jerusalem in the context of the medieval world,” as reproduced as an appendix to The Leper King and His Heirs. This entry was posted in Catholic Perspective and tagged Baldwin IV, Catholic leader, Crusader, leadership, Leper King, life, representative figure, sacrifice, Triumph of the Cross by Michael Whitcraft. Bookmark the permalink.